Since discovering Matt Haig on Twitter, I have become a firm fan of this writer's attitude to life, reading and writing. 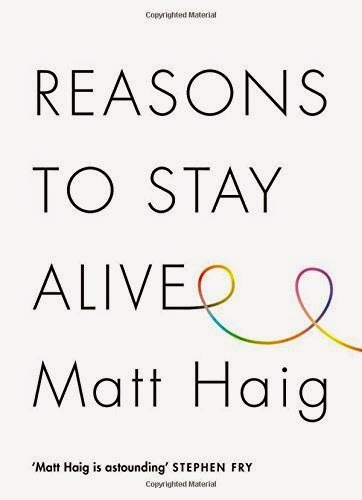 He has been startlingly open about his experience of depression online, and Reasons to Stay Alive is a fuller written account of this. First of all, there is a lot to be said about Haig's decision to write about this subject. While we have come some way towards a better understanding of depression and anxiety, we are still a long way off its reaching a position of equality with physical illness. As is pointed out in the book, suicide rates, in young men, remain high. This makes the act of writing this book all the more important. In a book which cannot easily be categorised (part memoir, part self-help, all heart), Haig explores the moment he experienced mental collapse, rapidly finding himself in the midst of the most frightening experience of his life, subject to extreme depression and panic disorder, and on the literal point of suicide. I cannot overstate the admiration I have for Matt for revisiting this dark time in his life. It is infinitely comforting to hear about his fear of leaving the house and the all-consuming nature of his anxiety. I know that may sound like an odd thing to say, but the voice of someone describing sensations one has experienced (albeit to a lesser extent) goes some way to overcoming the intense isolation of this type of illness. In particular, the way he explores the irrationality of the anxious mind will certainly strike a chord with many. In the book, there are a series of conversations between Present Me and Past Me which illustrate the irrational hopelessness of depressives. The point though, is not to dwell on the negative (and this is what makes Reasons to Stay Alive so poignant) but to find hope when it seems there is none. The voice of the present day Matt is able to look more objectively at his experience, even drawing out the ways in which it has made him the person he is today. When he writes about his 'thin skin' and how he wouldn't change this about himself, I appreciated the insight his far reaching self-awareness has afforded him; it is clear he has reached a level of self-acceptance which is not necessarily made easy by the society we live in. Interestingly, while there is much to get emotional about in the book, it wasn't until one of the final chapters, 'Things I have enjoyed since the time I thought I would never enjoy anything again', that I finally shed a few tears. He lists many of the simple and more profound pleasures of existence in this section: "Books. Cold beer. Fresh air... Talking to the person who knows me best... Cities twinkling at night as you drive past them." I think this section affected me so much because it illustrated the overall hopefulness of his story. His experience is evidence that even those who plummet to the darkest depths can find happiness and enjoyment again. So much of feeling better is about acceptance, about knowing oneself, and understanding that nothing is forever. This is a considered, thoughtful, and important book.